UPDATE: Download the Vyz interview with Craig Ranke where this issue is discussed. You'd think being a truth-teller in an ostensible Truth Movement would make one popular within said Movement. Not so fast, Diogenes. Craig and Aldo of the Citizen Investigation Team find themselves practically personnae non gratae almost everywhere but here and here. 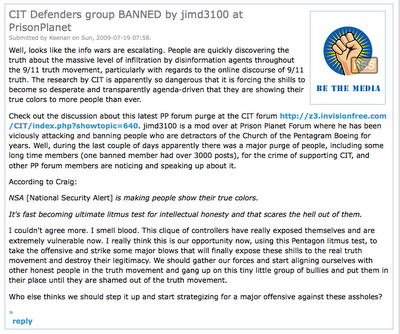 Jeffrey of the Rock Creek Free Press sent me the following screen shot of a post revealing how Alex "Arbiter of Truth" Jones has banned mention of CIT work from his site. WHY DO YOU THINK THEY CALL IT "KINDLE?" UPDATE (8/13/2009): Not that online petitions ever do a damn bit of good, but here's one regarding Kindle's 1984 hijinks. Kindle is on the face of it a useful gadget and offers certain advantages, but paper books are far more simple and elegant in that they are cheap, portable, and require no batteries. And text on dead trees doesn't vanish in mid-sentence due to any glitch, whim, copyright tussle--or government edict. The durability and immutability of the printed word far outweigh the capacity to monkey with typefaces and backlighting. Gutenberg had it right after all. Here's a memory that came back to me as I listened to Craig while pulling up weeds in the garden. I was working my mailman gig on 9/11, listening to the radio as I cased up my route. When I heard the news about the Trade Towers I was as amazed as everyone else around me. But having a suspicious mind forces one to immediately raise up the BS antenna whenever something like this happens. As the day went along and the news of the "plane flying into the Pentagon" reached my ears I knew immediately that something was very wrong. The military has something called a CIWS (close in weapon system) which serves as a last line of defence. I remember hearing 'speculation' when I was in the Navy (late 70' early 80's) that systems similar to the Pheonix CIWS we had on our ship were in place on the Pentagon and the White House to protect against suicidal flyers or missiles. The CIWS is a automatic machine gun that fires spent uranium projectiles directed by a computerized radar system that controls everything. Turn it on and anything that gets in range is destroyed. Spent uranium projectiles will rip through anything that flies. I never heard any question from the media to the military about the presence of the CIWS. And as far as the videos of the event, I guarantee you that if an unauthorized ant is walking on the pentagon lawn, they have a hidef picture of it. On that bizarre day in September I remember a gigantic WTF going through my mind when the tale of a plane hitting the Pentagon was told. I remember thinking: "How could those fools (and there are a lot of fools wearing brass) forget to turn on the CIWS system after planes had just hit the WTC and some planes were still unaccounted for? Craig Ranke, of the Citizen Investigation Team, discusses Magical Mystery Flight 77 on Think or Be Eaten with Vyz in a program available for download at this link. Indeed what, if anything, hit the Pentagon on Sept. 11, 2001? It sure as hell wasn't American Airlines Flight 77.